The Fourth » Just hang in there! Sorry Skarvs, it’s cuter when kittens do this. Nah, Skaervs looks plenty cute. But how would he die? Can he not swim? …also, it looks like Derk is sitting on Cyril’s head, and that amuses me. He gets eaten by an actual shark?! Considering his luck and the gods’ whims, that’s EXACTLY what would happen. Cyril doesn’t make a great chair to be honest. Too bony. The problem with being so bony is that OTHER people complain when you use THEM as chairs as well! He’s half shark, can’t the fool swim? Skarva is half shark, can’t the fool swim? Not super-humanly well or anything. He doesn’t have gills. It’s hard for anyone to swim in ocean currents and make it back to a distant shore, especially when they’re wearing freaking baggy clothes and a cape. Edna Mode shakes her head in disapproval. No problem! Captcha makes us all do crazy things. It took a good 3 minutes of staring at the screen to realize “commy” was short for Commadore and not Communist. Nah, the pirates are clearly the communists here. Look at how red their boat is! It’s good to know that the pirate captain has correctly deduced the relationship between Lorelei and Lord Skaerva. Wow, Courtney – you’ve grown tremendously since that earlier comic. Seriously! And I thought that page was pretty darn good at the time! I can’t wait for two more years down the line, when the current comic makes me embarrassed. They’re gonna need a crow bar in order to save our Sharkey Lord. 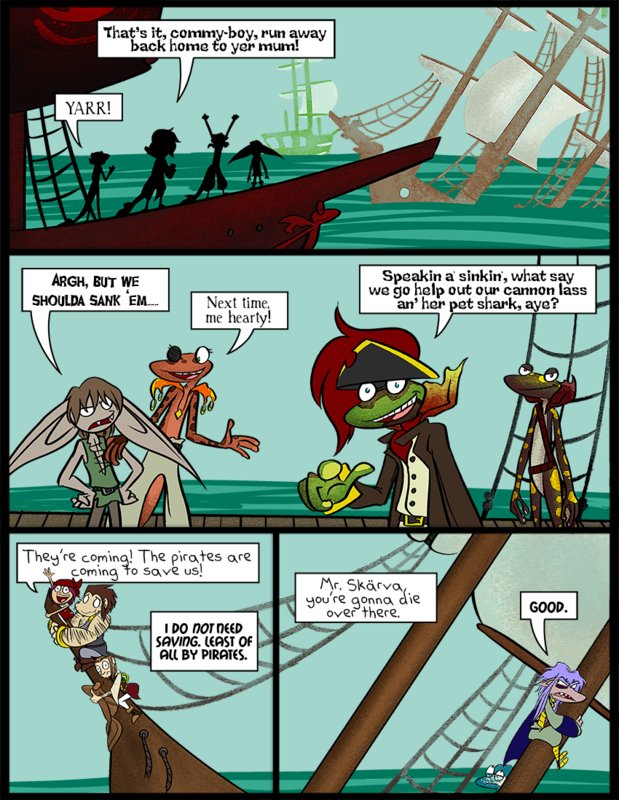 I never mentioned how awesome the pirate’s sails look. Is that also their jolly roger? Yeah, he needs a haircut soon or he’s gonna be tripping on those things. Lol you just have an awesome comic. Skarva, you snow that while that’s probably a decent way to meet the gods, you not a n-Ice enough guy, you have a snowball’s chance in hell of meeting the guys, you catch my Drift? The gods are certain to give him the cold shoulder. Is that guy at the end of panel 2 not wearing pants? She is most certainly not! It’s excusable for salamandrians to not wear any clothes at all, especially since they go swimming so much. But most of them wear at least something, because they want to. Like Goldgills is not about to be a pirate captain without a great outfit!